Car Fetish. I drive, therefore I am. The automobile is the foremost cultural touchstone of the 20th century, reflecting the social and cultural development of the western world and beyond. Both technical device and instrument of locomotion, it offers the most highly developed and widespread interface for human-machine interaction – while also functioning as a carrier of meaning, an individualized living room, a medium for escapes great and small, and a means of distancing oneself from others and of creating a personal profile. The attraction of speed and the new feeling of time and space ushered in by the advent of the automobile had a formative influence on (urban) perception and the rhythm of modern life in the early years of the 20th century. The view through the windshield still drives our outlook on life today, as well as coloring the cinematic perspective on reality. The exhibition "Car Fetish" demonstrates the wide range of art influenced by the automobile. Around 160 artworks are featured by more than 80 artists, among them Giacomo Balla, Robert Frank, Jean Tinguely, Andy Warhol, Gerhard Richter, Chris Burden, Damián Ortega, Richard Prince or Superflex. The symbolic and often irrational superstructure we have built up around the automobile and which guides our enthusiasm for this, our favorite toy, refuses to be defeated even by never-ending stop-and-go traffic jams. Correspondingly open and eclectic is the field of art that explores the car as cult object and imagination machine. At the center of the large-scale exhibition “Fetish Auto” at Museum Tinguely is a sweeping panorama across one hundred years of automotive history that examines this complex relationship both aesthetically and critically based on a representative selection of works. In recent years the study of fetishism has shifted its focus from the more exotic and marginal to centre of western consumer society and all that the world of goods seems to promise the purchaser. Although Modernism suppressed the (high) cultural phenomenon of fetishism as act of projection onto the object, it did not disappear, and thus today things still exercise for us a formative fascination based on their look and feel, attitudes and imagined qualities, as well as forms of use and handling. Examining this fascination based on the automobile as “complex thing” is one objective of the exhibition and the accompanying catalogue. The distinction between commodity, sexual and religious fetish hence becomes both an interpretative framework for the catalogue and a thematic access route to the exhibition. Automobility, or “self-propulsion” was a power the messengers to the gods already had at their disposal. And it so happens that in the year 2011 the car is celebrating its 125th birthday (in 1886 Carl Benz designed the famous Benz patented motorcar, the world’s first automobile). The exhibition at Museum Tinguely, conceived architecturally as a wheel with axis and radial segments, commences with the radical new concepts of art and society put forth by the Futurists, who linked human and machine symbiotically in a new aesthetic of constant acceleration. In the “Futurist Manifesto” of 1909, Filippo Tommaso Marinetti propagated automotive speed and the racecar as new ideal of beauty to replace the old model of the Nike of Samothrace. The Futurists worshipped the machine realm, dedicated poems to the racecar and struck up a “Hymn to Death.” In the visual arts Giacomo Balla and Luigi Russolo were the main figures to depict impressions of automotive movement as synaesthesia of light, sound and speed in the urban environment. These two artists form the historical prelude to the exhibition, with their own room in which visitors can experience the intoxication of the senses triggered by a panorama of works. Two larger galleries in the “Fetish Auto” show are devoted to high points of the automotive worldview in the art of the 1960s and 70s. In many works of American Pop Art and its forerunners, the “American way of life,” genuinely bound up as it is with the car and the mobile lifestyle, along with its propagation in the mass media, is the chosen theme of artists such as Andy Warhol (“Disaster Series,” “Cars”), Ed Ruscha, John Chamberlain, Robert Rauschenberg, Mel Ramos, Roy Lichtenstein and Don Eddy. In Europe on the other hand, it was the Nouveau Réalisme movement exemplified by the works of Arman, César, Gérard Deschamps, Mimmo Rotella and Jean Tinguely that transformed the commodities of machine and automobile into art, whether by splashing them across posters or by layering, compressing or degenerating their material forms. 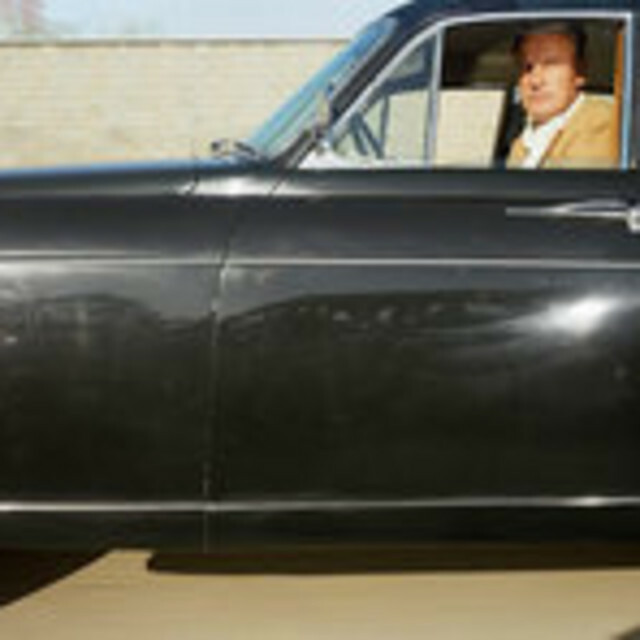 In European varieties of Pop Art as well, as practiced for example by Konrad Klapheck, Paul Stämpfli and Franz Gertsch, and also in the work of artists exhibiting media-reflective tendencies such as Gerhard Richter and Wolf Vostell, the car often serves as a pictorial protagonist or a mirror of social developments. Wolf Vostell (“Das Theater ist auf der Strasse”) and Allan Kaprow, two of the main figures in Happening and Performance Art have been chosen for the exhibition. Allan Kaprow’ s 1961 “Yard,” made of towering stacks of tires, has been restaged for the show. The stroll through the art history of automotive inspiration from the Futurists to today is accompanied in the exhibition by a second, theme-based, thread. The visitor can choose to approach the exhibition by way of art that fell under the sway of commodity fetishism (lacquer and chrome, the car acquisition as purchase of fictions and redirection activity, assembly line production and accumulation) with works by Ant Farm, Arman, Edward Burtynsky, Jan Dibbets, Hans Hansen, Peter Keetman, Len Lye, Hendrik Spohler, Peter Stämpfli and Patrick Weidmann; or through the art of religious fetishism (auto da fé, “Déesse,” nail fetish and car cemetery) with works by Kudjoe Affutu, Chris Burden, Jordi Colomer, Walker Evans, Jitish Kallat, Annika Larsson, Superflex and Dale Yudelman; or as sexual fetishism (phallic extension, motor potency, female curves, the car as bachelor machine) with works by Liz Cohen, Sylvie Fleury, Wenyu Ji, Allan Kaprow, Richard Prince, Pipilotti Rist, Bruno Rousseaud and Franck Scurti. Further apotheoses of the automotive state of mind can be found in rooms focusing on themes such as the accident, with works by Brassaï, James Dean, Robert Frank, Jacques-Henri Lartigue, Mickry 3, Arnold Odermatt, Roman Signer and Wolf Vostell; on speed, with works by Horst Baumann, Géo Ham, Jacques-Henri Lartigue, Richard Prince, Man Ray and Anton Stankowski; and on traffic, with works by Andreas Feininger, Robert Frank, Jacques-Henri Lartigue, Julian Opie, June Bum Park, Peter Roehr, Samuel Rousseau, Bruno Ruckstuhl, Michael Sailstorfer, Stefan Sous and Peter Stämpfli. Finally, a further gallery is devoted to the subjects of “Retreat and Flight” or “Living Room and Outer Space,” featuring works by Michel de Broin, Edward Kienholz, Hans-Peter Feldmann, Zilla Leutenegger, Thomas Mailänder, Ahmet Ögüt, Betsabeé Romero and Andrea Zittel. In the middle, set up as axis of the entire show, is Damian Ortega’s large-scale work "Cosmic Thing,” a VW Beetle exploded through the space. At the entrance of the exhibition the visitors will be able to enjoy a selection of Andrew Bush’s Cardriver portraits “on the move”. An automotive love story compiled by Virgil Widrich out of famous film scenes will run continuously in the museum auditorium during the show. Finally, a further gallery is devoted to the subjects of “Retreat and Flight” or “Living Room and Outer Space,” featuring works by Michel de Broin, Edward Kienholz, Hans-Peter Feldmann, Zilla Leutenegger, Thomas Mailänder, Ahmet Ögüt, Betsabeé Romero and Andrea Zittel. In the middle, set up as axis of the entire show, is Damian Ortega’s large-scale work "Cosmic Thing,” a VW Beetle exploded through the space. At the entrance of the exhibition the visitors will be able to enjoy a selection of Andrew Bush’s Cardriver portraits “on the move”. An automotive love story compiled by Virgil Widrich out of famous film scenes will run continuously in the museum auditorium during the show. Museum Tinguely has several works in its collection that were directly inspired by cars or that use car parts as material. Jean Tinguely was a great devotee of the “most beautiful artwork” in the world. He for example converted two racecar chassis into a winged altar, warned of the transience of western consumer culture by means of a drivable sculpture crafted from a Renault Safari, and arranged Eva Aeppli’s “Five Widows” with a Lotus racecar he had purchased (once driven by world champion Jim Clark) into a memorial assemblage for the often-fatal driving circus that is the Formula 1. For Tinguely as a Nouveau Réaliste, a great passion for speed and for the machine (he was notorious early on for his many car accidents) flowed into his work, and he hardly ever missed a Formula 1 race. Jo Siffert was a friend, as was the Swede Joakim Bonnier and racer Niki Lauda. Tinguely fanatically collected cars, preferably Ferraris, liked to drive Mercedes and decoratively painted a sidecar tandem that he sponsored in races. Restless Jean was – like the Futurists – besotted by the myth of speed. His relationship with the automobile was shaped both by euphoria and pessimism. In numerous essays from a broad range of cultural-historical, sociological and psychological perspectives, the exquisitely crafted catalogue illuminates our complex relationship to the automobile. Several prominent authors contributed: Prof. Dr. Hartmut Böhme writes on “Automotive/ Fetishism”, Prof. Dr. Ludger Lütkehaus offers a “pamphlet on the psychology of the thing,” Dr. Matthias Bickenbach explores the accident as a baneful prediction. In addition, Harun May examines the discovery of velocity and Micha Hilgers the car as fetish and identity-prosthesis. David Staretz dedicates a eulogy to the bend as last situ of automobile freedom, Thomas Pittino eyes up the love story between cars and films as two emotion-creating machines, and Jean Tinguely’s autophilia is treated by Manuela Kraft in its own chapter. The 364-page catalogue edited by Kehrer, Heidelberg will be published in German and English.